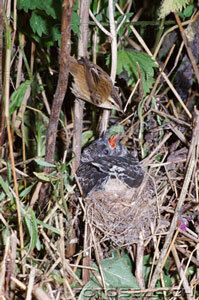 A Sedge Warbler is the Hijacked “Nanny” of this cuckoo chick. 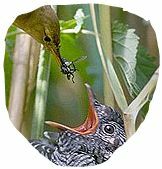 A common cuckoo chick gets a meal from a Reed warbler, whose nest was hijacked by a female cuckoo. The warbler hatched the cuckoo egg and raises the chick as if it were her own. Like thieves who yell “fire” to clear a store before robbing it, cuckoos appear to have evolved hawklike plumage patterns and physical traits that temporarily scare potential hosts from their nests so they can lay eggs in them and get other birds to rear them. —-> CLICK HERE to go to the whole article. It’s fascinating!